It may be surprising these days to come across teenagers who know less about computers than the older generation. But that’s the situation in Tyume Valley. Few families can afford computers or tablets and wifi/broadband connectivity is very poor. So in December 2018, TVS ran a two-week study camp for a selected group of school leavers who were expected to do well in their Matric (end of school) exams and go on to university or further education. Enable students to use Microsoft Office and to access the internet for research and email, in preparation for further education/employment. Improve students’ spoken English and confidence in speaking to a group. 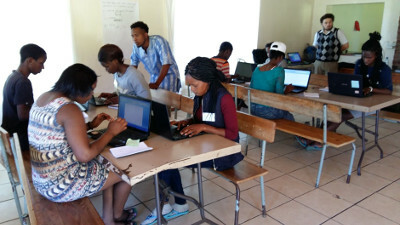 The study camp was run by TVS volunteers Stephanie and Tim Gallier, supported by TVS' IT trainers Vuvu and Nontombi and local volunteer Selby. Twenty seven students from four secondary schools took part. 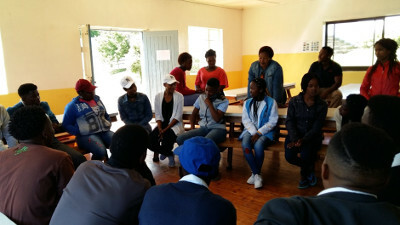 The first (residential) week was held at Hobbiton Outdoor Activity Centre in nearby Hogsback, where students alternated between outdoor activities and learning Microsoft Office basics. They were introduced to Word, Powerpoint and Excel, using a business context for the content. The students produced a variety of documents and presentations and were also taught to use mind-maps to organise their ideas and as a research tool. For the second week, students made their own way each day to University of Fort Hare in Alice. In a tremendous improvement over previous years, the study camp was able to use a computer lab in the University’s Great Hall, which housed over 100 networked laptops. This saved time having to set up and charge our own computers, and brought access to fast wifi connections and helpful technicians. The curriculum for the second week included setting up and using e-mail accounts; internet research on potential careers and business ideas; compiling CVs; and work in small groups to design Powerpoint presentations for a business start-up. The latter were delivered in ‘Dragon’s Den’ style to a small group of study camp tutors and local community members. The second week also included a visit to the UFH Art Gallery and archives. The students were highly motivated and worked well as a group. Only two had had previous experience of a TVS study camp in primary school. A few students had used a laptop, though mostly for playing DVDs. Most used smartphones, mainly to access social media platforms and YouTube. All the students made marked progress, particularly in their overall confidence and understanding of spoken English, in their acquisition of IT skills and in working together in a team. They were all able to send and receive emails with pdf attachments. All the students completed and saved a personal CV and researched career and job opportunities in SA. The most popular element of the course was Excel, though this did reveal some poor mental arithmetic skills! We will be keeping in touch with the students as they move to the next stage of their education and careers. "To me this is a good and excellent course for young people from rural areas and it does wonders." "I think you have done so well to me by giving me more information about computers and now it is in my hands." "You should keep on doing this and teach more children so that they can be able to use laptops too. It is a good thing that you are doing."